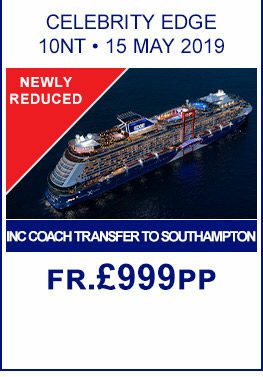 Plus additional guests on the booking will receive a saving of 50% from the Cruise Only fare. Luxury holidays in unique destinations—that’s the pleasure of cruising with Celebrity Cruises. Renowned for their contemporary and elegant approach to ocean travel, Celebrity Cruises offer a collection of outstanding luxury cruises at competitive prices, making them the perfect choice for couples looking for a refined and cultured experience. Join Celebrity Cruises on one of their award-winning cruise breaks and take your pick from an exceptional range of over 280 worldwide destinations. With a growing fleet of elegant ocean liners, Celebrity Cruises now offer their signature cruise holidays in more exciting destinations than ever, so you can take advantage of their outstanding service and wonderful amenities. Includes Hotel Stay In Fort Lauderdale , FREE Drinks, Gratuities & upto $300 OBC on Oceanview and above! Brand New Luxury - Celebrity Edge , Includes 2nt Hotel Stay in Miami! , FREE Drinks, Gratuities & upto $300 OBC on Oceanview and above! Book Now - ZERO Deposit! , Includes Hotel Stay In Miami or Fort Lauderdale! FREE Drinks, Gratuities & upto $300 OBC on Oceanview and above! , Book Now - ZERO Deposit! , Includes Hotel Stay In Miami or Fort Lauderdale! FREE Hotel Stay In Miami! , FREE Drinks On Oceanview And Above! , FREE Drinks, Gratuities & upto $300 OBC on Oceanview and above! Free Upgrade from Oceanview to Balcony Stateroom! , Includes Hotel Stay In Fort Lauderdale , FREE Drinks, Gratuities & upto $300 OBC on Oceanview and above! FREE Drinks, Gratuities & upto $300 OBC on Oceanview and above! , £0pp Deposit! 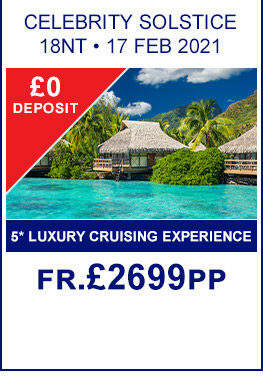 5* Luxury Cruising! , FREE Drinks, Gratuities & upto $300 OBC on Oceanview and above! , £0pp Deposit! 5* Luxury Cruising , Includes 3nt San Francisco Stay! 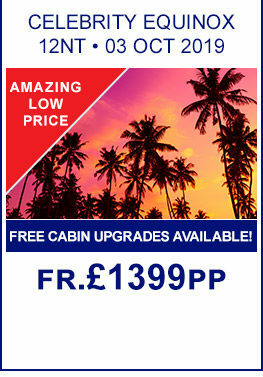 5* Luxury Cruising , Includes 3nt Los Angeles Stay! 5* Luxury Cruising! , All Flights and Transfers Included! , FREE Drinks, Gratuities & upto $300 OBC on Oceanview and above! Free Upgrade from Oceanview to Balcony Stateroom! , 5* Luxury Cruising! , All Flights and Transfers Included! , FREE Drinks, Gratuities & upto $300 OBC on Oceanview and above! FREE Upgrade From Balcony Class To Concierge Class! Fantastic Low Price! , FREE Drinks On Oceanview And Above! 5* Luxury Cruising! , FREE Drinks On Oceanview And Above! 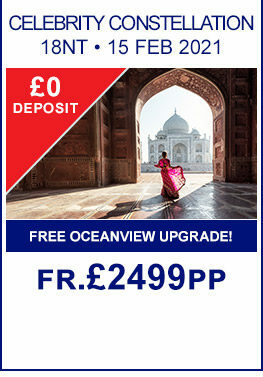 , £0pp Deposit! 5* Luxury Cruising! , Includes Singapore City Hotel Stay! , FREE Drinks On Oceanview And Above! Discover the world in luxury and comfort aboard a Celebrity Cruises ocean liner and savour the chance to visit an extraordinary array of destinations across all seven continents. Celebrity Cruises travel to 286 destinations in 72 countries, giving you the opportunity to see and experience more of the things you love. Whether you choose to cruise the timeless waters of the Mediterranean or Caribbean, or travel further afield to visit destinations such as New Zealand, Australia, or Southeast Asia—Celebrity Cruises can get you there in total luxury and refinement. The cruise line places a special focus on cultural cruise holidays for discerning globetrotters, helping you discover all the wonders of the world in one seamless, uninterrupted journey. We launched The Celebrity Revolution℠ to do one thing - transform the way you experience the world. It began with the introduction of our new ship, Celebrity Edge, with an innovative outward-facing design that connects you to the sea and the destinations beyond like never before.And now, we're bringing together more than 500 leading architects, designers, and engineers to take our entire award-winning fleet to the edge with new design concepts inspired by the ship that started it all, Celebrity Edge. This isn’t a makeover. It's a $500-million revolution.